Union Cabinet chaired by Modi approved Memorandum of Understanding (MoU) between India and Poland for co-operation in the field of civil aviation. The objective of Memorandum of understanding is to recognise the mutual benefit of cooperation in civil aviation, particularly improving regional air connectivity in India. Maintenance personnel and aircrew members. The MOU will also helps to exchange of information and expertise between the civil aviation authorities of the two countries, collaboration on conducting training programmes, research and studies. 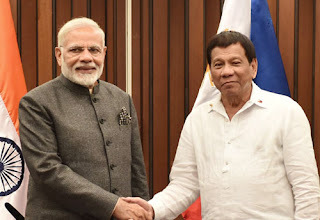 India and Philippines signed four MOUs in different filed. This MOUs will help to further boost the bilateral relations between two countries. An MOU was reached between IIT-Delhi and Indian Oil Corporation. MoU aims to develop a long-term framework for research collaboration and advancement of technology. The main objective of the MoU will be for the two organizations to collaborate for promotion of education, research and innovation in the areas of mutual interest. An Memorandum of understanding reached between Andhra Pradesh government and Toyota company. The objective of MOU is to introduce electric vehicles in the state. An agreement was reached between Japanese company Toyota and Suzuki, as per agreement Suzuki will manufacture electric cars for India and supply some units to Toyota with technical support from the latter. Union Cabinet approves agreement between India and Belarus on Scientific and Technological Cooperation for mutual benefit in the areas of science, technology, agriculture, etc.